Crunch time! If you haven’t gone to one of the mall studios or had your photos done by a professional photographer yet, then you’re probably scrambling to find that one awesome picture taken of you and your whole family that you can print from your home computer. I know. That’s what I did and came up with a really cool picture that someone took of our family on my birthday in July! The ironic thing is that I’m a photographer myself and I’ve taken lots of family holiday photos since October. Talk about foresight! These families probably had their photos printed and mailed right after Thanksgiving. One of the coolest photo sessions I had this year was with Ms. Sharon and her grandkids – every year she gathers her grandkids and creates a scene from the Bible. 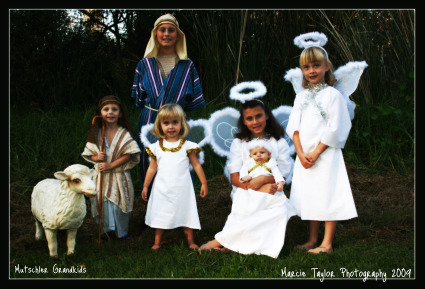 Last year, she did the Nativity and this year, I was hired to photograph her six grandchildren as shepherds and angels. It took much patience and coordination but we pulled it off – it was a lot of fun to shoot and I think the family members (including the parents who acted as stylists, baby wranglers and props people) had a good time too. But there is ALWAYS email right? You could email your friends and family your yearly newsletter with a few pictures or you could have some fun and do one of the following. The guys at Jib Jab have done it again. The dancing elves are back. Remember you can upload up to five elves. Check me out as an elf getting my disco groove on. You can use SLIDE.com which I use on this blog a lot or check out SMILEBOX.COM where you can in their words “Share life’s moments in minutes.” Get creative – make an ecard or a slideshow with music. And finally, this is something cool for the kiddies.